As the most multicultural country in the world, Australia has benefited immensely from the immersion of the many different cultures that are represented in our population. 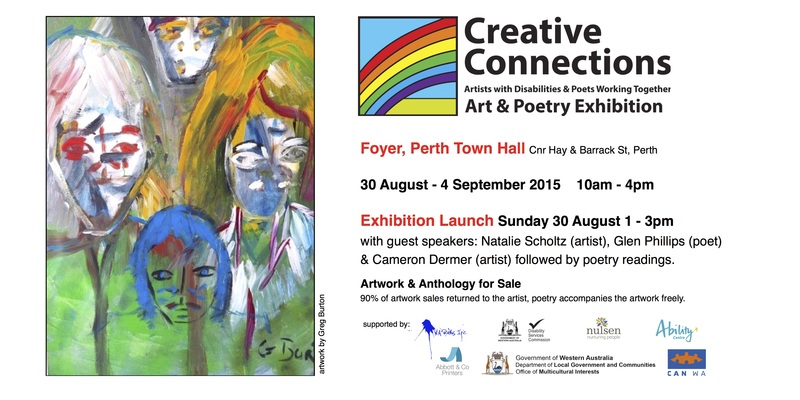 The 2015 Creative Connections Art & Poetry Exhibition will benefit the community by the immersion of artists with varying abilities and WA poets into an eclectic exhibition of colour, shapes and words, based on their own cultural backgrounds. The aim of the Exhibition is to use art as an important vehicle for artists with disabilities to communicate concepts and emotions in a universal manner; to enable them a voice and an avenue of expression and acceptance, enhanced by the ekphrasic response to the artwork by poets who interpret and insert their own cultural bias in the poetry written to the artwork. The Exhibition acts as a forum where people are recognised for their ability and not their disability, where the creativity of artists with disabilities from diverse multicultural backgrounds is highlighted and the unconstrained artwork provides inspiration for poets which, through example and their own experiences, help motivate members of the community to acknowledge all cultural groups and become active in multicultural activities. What is evident in this exhibition is the varied and often intense ability of many culturally diverse people. Creative Connections endeavours to champion the efficacy of art and poetry for personal development, to provide a sense of purpose and develop self esteem in all people; to provide opportunities to ensure art produced by artists with disabilities is recognised by the community and poetry is accepted as a valid form of expression for often complex and poorly understood ideas and beliefs. Finally the exhibition is a means to demystify and help remove barriers between the community, people with disabilities and the many cultural groups.